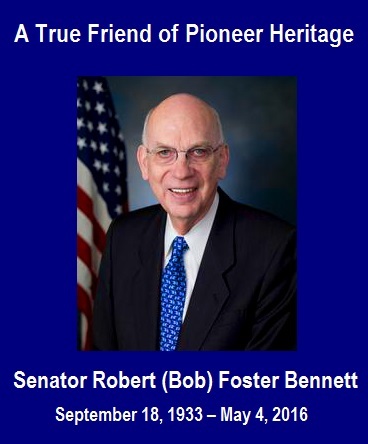 The Mormon Pioneer National Heritage Area honors a friend of Pioneer Heritage and Champion of Historical Preservation in the State of Utah – Senator Robert (Bob) Bennett. He will be greatly missed. The Mormon Pioneer National Heritage Area has lost a hero in the passing of former Sen. Robert Bennett who sponsored the National Mormon Pioneer Heritage Act, which brought the MPNHA into being. Sen. Bennett, 82, died May 4 of complications related to a recent stroke. He also had pancreatic cancer. The senator fought tirelessly to ensure passage of the bill, which after being passed by the Senate, received the support of the House of Representatives on July 24, 2006. The Act was signed into law by President George W. Bush on Oct. 12, 2006. Sen. Bennett’s love for the area grew out of the many trips he took through the state campaigning for his father U.S. Senator Wallace Foster Bennett. Sen. Bennett had a long and distinguished political career, serving three terms as a U.S. senator.